I’m loving Mr. Porter, they really take a lot out from the effort to stay “effortlessly” stylish. 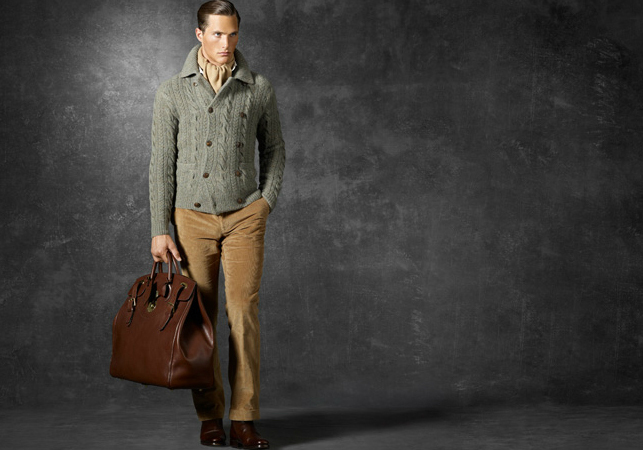 Handknit, classically elegant and in 14 ply cashmere and super-fine merino wool, this well constructed double-breasted cable knit cashmere cardigan from Ralph Lauren Purple Label collection justifies the hefty price tag (it almost costs as much as a mid-range luxury watch)- $1659. I can almost sense your collective eyebrow raises but believe me when I say this slim cut, double breasted knit cardigan is not only timeless but daringly trendsetting. Subtly sophisticated with its ten buttons, two pockets and ribbed collar; You could almost pull a Tom Ford “Bond” look but with 10x more cachet. This cardigan offers a fresh, stylish take on traditional knitwear and styled to perfection by Mr. Porter with a Charvet tie, John Lobb shoes and Ralph Lauren Purple Label shirt and trousers.